Baptism is a sacrament of welcome. Jesus invites everybody to come to him and share his life. He especially loves children and wishes them to be close to him. We welcome enquiries from parents about the baptism of their children. We invite them to attend a meeting to explore the meaning of baptism and its implications for the life of the child. The person who is baptised is invited to ‘taste and see that the Lord is good’ (Psalm 34:8). It takes a lifetime to grasp the riches of the mercy and love of God. When the person being baptised is a child the responsibility of forming the child in the faith falls on the parents and the parish community. The need for formation is clearly stated in the Introduction to the Rite of Baptism for Children: ‘To fulfil the true meaning of the sacrament, children must later be formed in the faith in which they have been baptised. The foundation of this formation will be the sacrament itself which they have already received. Christian formation, which is their due, seeks to lead them gradually to learn God’s plan in Christ, so that they may ultimately accept for themselves the faith in which they have been baptised’. (Introduction No. 3). We look forward to sharing the joy of the celebration with parents and families. As a parish community, we look forward to supporting parents and families as they accompany their children on the journey of faith. Eibhlinn Mary Reihill Battstown, Collinstown. Michael Gerard Collins Tuitestown, Collinstown. Willow Mary Hopkins Rosmead, Delvin. Lucy Patricia Gilsenan Crowenstown, Delvin. Caitlin Mae Lynch Killadoran, Delvin. Tadhg William Powell Aquila Rd. St. Helier, Jersey. Lily Kiera Meaney. Dryderstown, Killulagh. Rebekah Cath Vaughan Stonestown, Delvin. Naoimi Rose Agaci 28 Castleview Delvin. Elias Michael Agaci 28 Castletown, Delvin. Simon Anthony Conway 8 The Green, Delvin. Evan Denis O' callaghan. Graftonstown, Delvin. Rebecca Mc hale. Bracklyn, Delvin. Erikas Lavrikaitis 5 lacora Glen, Delvin. Lucas Timothy Gheorghe 5 Cois Lene, lake Road, Collinstown. Grace Emily Lynch 33 Lacora Glen, Delvin. Abbie Bethany Farrington Ballinacor, Delvin. Emily Katie Murtagh. 17 Cois Caislean, Delvin. Chloe Rose Geoghegan. Ballinvalley, Delvin. Lauren Angela Gaffney. Main St, Delvin. Oisin Michael Mc Grath _ Lucas Cartenstown, Delvin. Senan Mc Kendry 21 Loughanstown, Drumcree. Isabella Mc Cormack. Billistown, Delvin. T. J. Clune. Martinstown, Delvin. Lucy Ella Ledwith. Ballyowen, Delvin. Ava Jane Ivory. Mitchelstown, Delvin. Aaron Patrick Cogan. Hiskinstown, Delvin. Tadhg Patrick Clune. Bolandstown, Delvin. Robyn Mc Quaid Castleview Court, Delvin. Beibhinn O' Shaughnessy. 24 Stoneyford Park, Delvin. Shea Thomas Mc Quaid. 35 Stoneyford park, Delvin. Casey Rose Farrelly. Ballyowen, Delvin. Bill Anthony Fox Dardistown, Bracklyn, Delvin. Sean Luke Newman. Ballyhealy, Delvin. Logan Thomas Powell. Main St, Delvin. Ned Connell Monaghan. Clonmorrill, Delvin. Sadie Ann Tuite. 31 Stoneyford Park, Delvin. Maggie Roisin Leonard. Sheepstown, Delvin. Alexander Murray. 9 Raiskeen Place, Clonmellon. Lucy Rose Scally. Glaxtown, Collinstown. Caitlyn Patricia Flynn. Printinstown, Delvin. Donnacha O' Grady. 44 Castleview, Delvin. Everly Hope Doyle. Killallon Road, Clonmellon. Alfie John Gough. 37 Stoneyford Park, Delvin. Jamie Lee Jones. Sheepstown, Delvin. Carley Megan Kilmurray. Battstown, Collinstown. Iarla Og Michael Griffin. The Green, Delvin. Oisin Ward. 14 Mount Prospect, Mullingar. Dillon Ward. 14 Mount Prospect, Mullingar. Saoirse May Smith Dryderstown, Killulagh. William Hugh Leonard. Myleroe, Delvin. Kaiden Mc Quillan. Robinstown, Delvin. Lutz Kellen Balrathboyne, Glebe, Cortown. Harry Nicholas Pickering. Battstown, Collinstown. Marcus Peter Daugela Dryderstown, Killulagh. Matthew Philip Monaghan. Clonmorrill, Delvin. Michael Thomas Brady. Clonleam, Delvin. Lauren Grace Farrelly. Martinstown, Delvin. Killian Mc Hale. Ballyowen, Bracklyn. Delvin. Daniel Zach Cosgrove. 40 Gleann Pettiswood, Mullingar. Luke Ryan Cosgrove. 40 Gleann Pettiswood, Mullingar. Stan James Smyth. Killough, Delvin. Joseph Peter D Smyth. Clonmaskill, Delvin. Erin Kate Dowdall 66 College Hill, Mullingar. Carla Mary T. Briody. Mulliganstown, Delvin. Mia Ann Barry. Hiskinstown, Delvin. Tadhg Barry Esker View, Ballinvalley, Delvin. James Adam Gaffney. Clonleam, Delvin. Maeve Drum. Clonmaskill Hse, Delvin. Tom Anthony Fallon Balrath, Delvin. Nathan Marti Durkin. Graftonstown, Delvin. Edward Patrick Dillon. Clonyn Castle, Delvin. Adam Anthony Clune. 1. Cois Caislean, Delvin. Eimear Mary Cassidy. Rickardstown, Collinstown. Rosie Margaret Clune. Balrath North, Delvin. Ronan Price. 13 Stoneyford Park, Delvin. Skye Annaleise Audrey. Castletown, Delvin. Hannah Mae Ledwith. Ballyowen, Delvin. 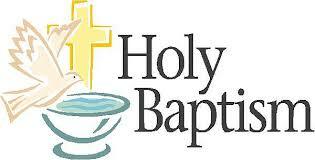 The Baptism preparation course welcomes parents and godparents.